Hundreds of dignitaries gathered in Washington to honor the former president. President George H.W. Bush once said about his funeral and lying in state, "Do you think anyone will come?" On Wednesday, after thousands of teary-eyed visitors waited hours in the December cold to pay their respects to the late president in the U.S. Capitol Rotunda, hundreds of dignitaries, heads of state and family members gathered at the Washington National Cathedral for a state funeral honoring his life and answering his humble question with a resounding "yes." 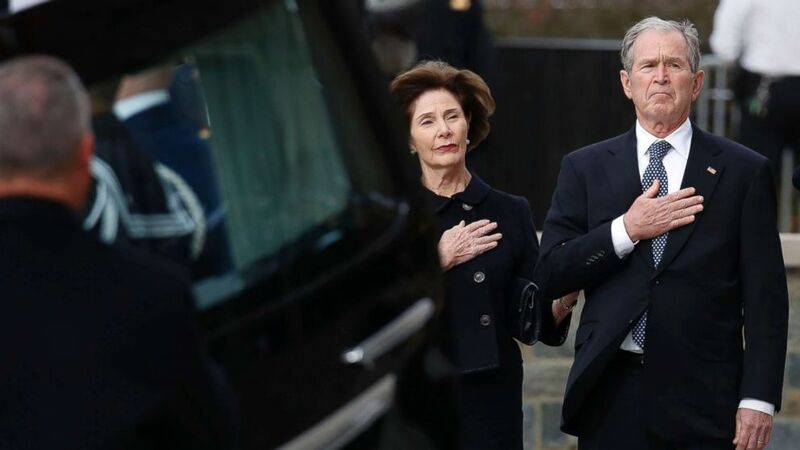 The final eulogy came from the son who followed in his footsteps, George W. Bush, the 43rd president who often referred to his father endearingly as "41." 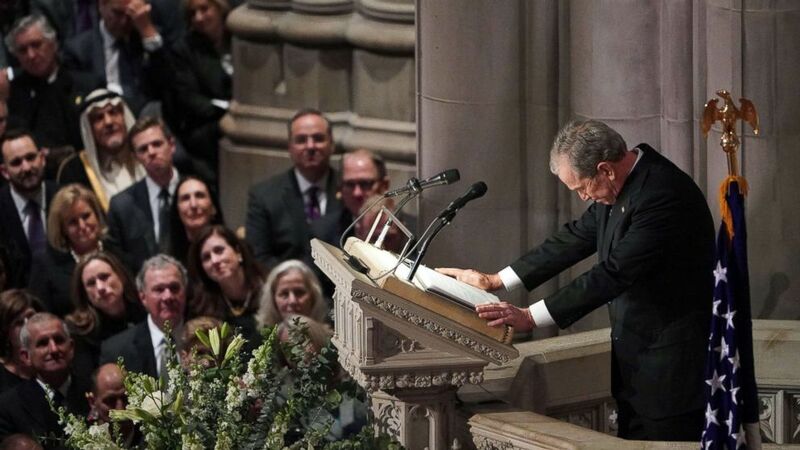 "He was a genuinely optimistic man," said Bush, recounting stories, as others did, that made the those gathered react with knowing and generous laughter. 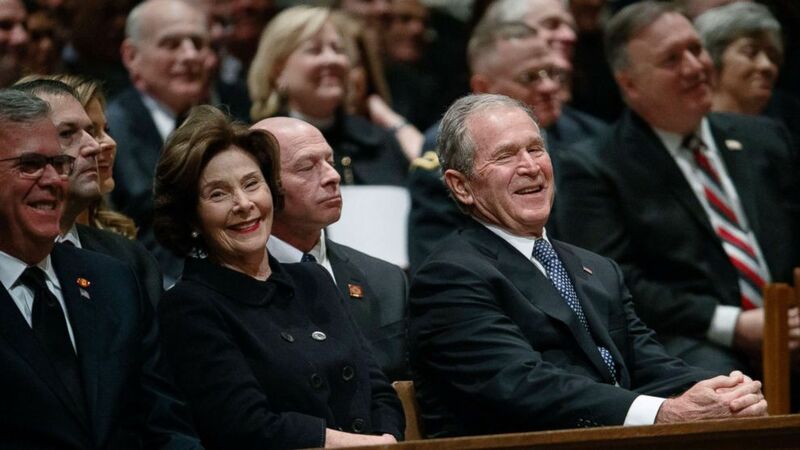 (Evan Vucci/AP) Jeb Bush, Laura Bush, and former President George W. Bush share a laugh as a story is told about former President George H.W. 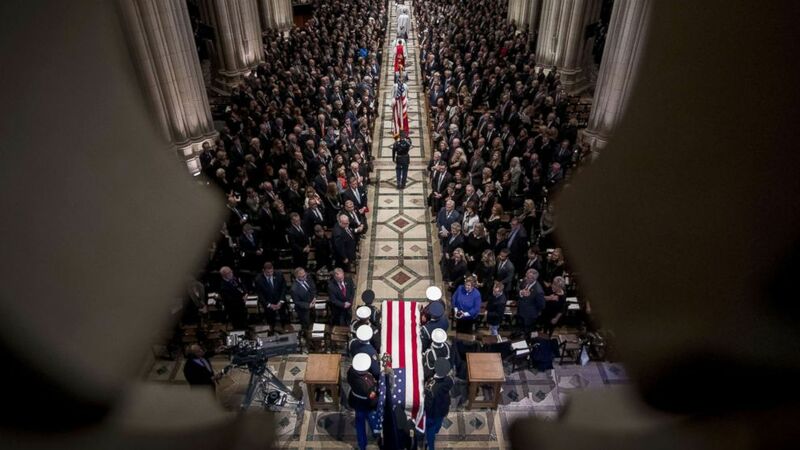 Bush during a State funeral at the National Cathedral, Dec. 5, 2018, in Washington. "Of course, he wasn't perfect," Bush said. "The man couldn't stomach vegetables," especially broccoli, he said, adding it was a genetic trait he'd passed along to his children. As he neared the end, he broke down as he described him as "the best father a son or daughter could have." He spoke of the last conversation he had with his father, which ended with the late president's last words. "Dad, I love you and you've been a wonderful father," Bush said he told his father. "And the last words he would ever say on earth were 'I love you, too,'" Bush said. (Mandel Ngan/AFP/Getty Images) Former President George W. Bush speaks during the funeral service for his father, former President George H. W. Bush at the National Cathedral in Washington, D.C., Dec. 5, 2018. His father, who died last Friday at age 94, has been memorialized among a bipartisan chorus of voices since his death for his commitment to national service and dedication to his family. His funeral service at the National Cathedral marked a rare and very public gathering of the nation’s living presidents and first ladies. The last time the Bush, Clinton, Trump and Obama families were at the same public event was in January 2017, at Trump's inauguration. (Chip Somodevilla/Getty Images) President Donald Trump and first lady Melania Trump greet former President Barack Obama and Michelle Obama as they join other former presidents and vice presidents and their spouses for the state funeral for former President George H.W. Bush at the National Cathedral, Dec. 5, 2018 in Washington. President Donald Trump and first lady Melania Trump entered the cathedral just before the services began. Trump handed his coat to a member of the military before sitting down beside his wife, who sat next to the Obamas on the end of the row. Next to the Obamas sat the Clintons and the Carters. The president and the Clintons didn't exchange greetings, though both Trump and the first lady said hello to the Obamas. 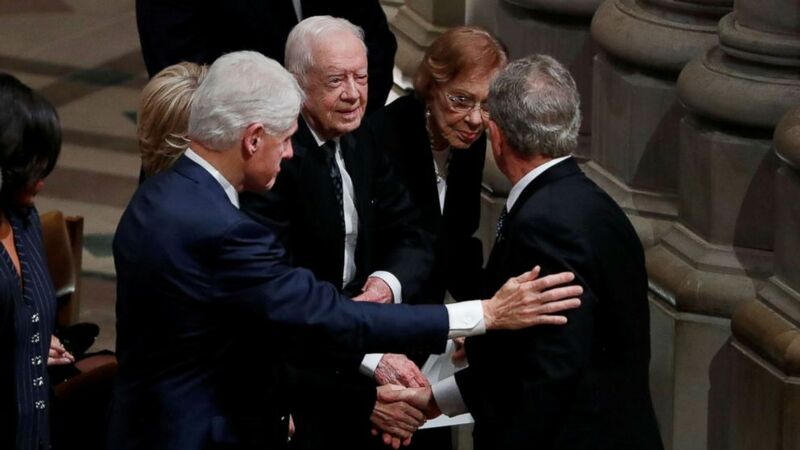 (Kevin Lamarque/Reuters) Former President George W. Bush greets former President Bill Clinton, former President Jimmy Carter and former first lady Rosalynn Carter as he arrives at the state funeral for his father, former President George H.W. Bush at the Washington National Cathedral, Dec. 5, 2018. 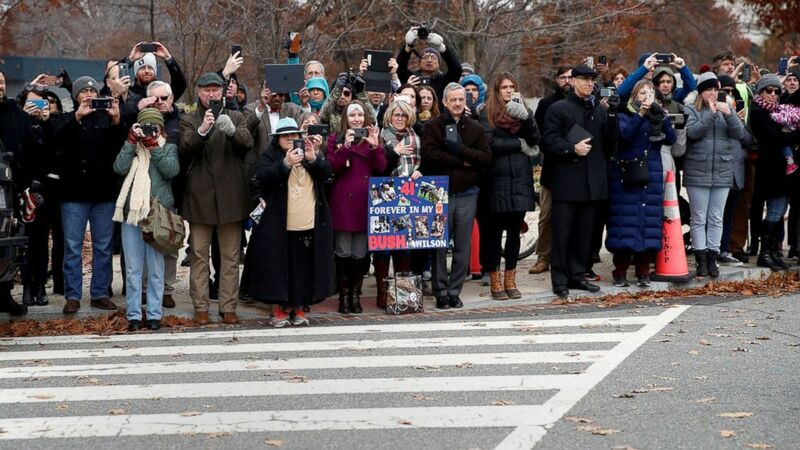 While the presidents, first ladies and hundreds of Washington power figures gathered at the cathedral, the city of Washington watched as the motorcade carrying the remains of the 41st president left the Capitol for a final time. 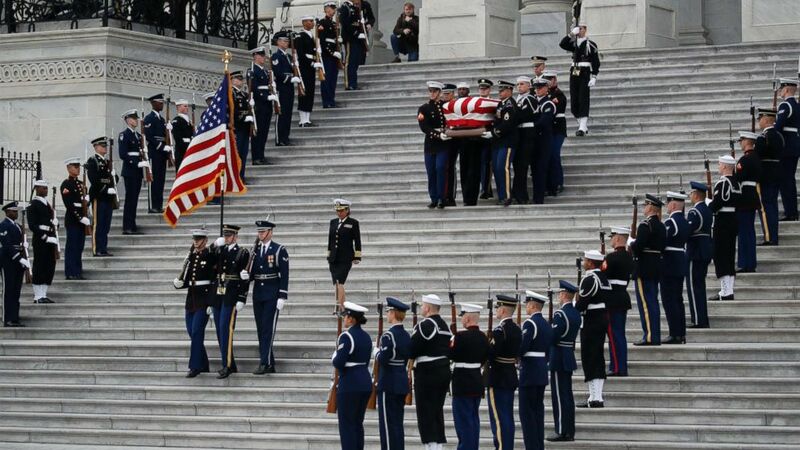 The Bush family stood with their hands on their hearts as the casket was carried slowly down the Capitol steps as a military band played "Nearer My God to Thee." A hearse then began the drive to the cathedral past streets lined with mourners. (Alex Brandon/Pool via AP) The flag-draped casket of former President George H.W. Bush is carried by a joint services military honor guard from the U.S. Capitol, Dec. 5, 2018, in Washington. The first eulogist, historian and Bush biographer Jon Meacham, told the story of a 20-year-old George H.W. Bush surviving being shot down during World War II. For the rest of his life, Meacham said, he asked, nearly daily: 'Why me? Why was I spared?' The rest of his life was spent proving himself worthy of that salvation, Meacham said. "America's last great soldier-statesman," he called him. "An imperfect man, he left us a more perfect union." Meacham recalled how Bush, while campaigning in New Hampshire, once shook hands with a mannequin. "You never know, gotta ask," Meacham said Bush replied when told. Other eulogies came from former Canadian Prime Minister Brian Mulroney, who spoke of Bush as a world leader. "Every single person knew you were dealing with a gentleman," he said. Former Wyoming GOP Sen. Alan Simpson, an old friend, spoke of the many laughs they shared -- and promised not to speak too long. Simpson joked that Bush had a good sense of humor -- one he "never lost" -- despite never being able to remember a punch line. "Humor is a universal solvent against the abrasive elements of life," Simpson said. That's what humor is." Bush "never hated anyone," he said. The funeral program itself was largely reflective of Bush's own service in the military and includes full state's honors and performances by the U.S. Marine Chamber Orchestra, the Armed Forces Chorus, the Air Force Singing Sergeants and the "President's Own" Marine Band, among others. (Andrew Harnik/Pool via Getty Images) The flag-draped casket of former President George H.W. Bush arrives for a State Funeral at the National Cathedral, Dec. 5, 2018 in Washington, D.C. It marked a contrast to the funeral service scheduled for Thursday after the president's return to Texas, which is said would feature friends of the family from "west of the Mississippi" and would include performances from the Oak Ridge Boys and Reba McEntire. (Alex Brandon/Pool via Reuters) People line the street as the hearse carrying the flag-draped casket of former President George H.W. Bush heads to a State Funeral at the National Cathedral, Dec. 5, 2018, in Washington. Trump's public statements about Bush since his passing and the White House's coordination of the service have largely received praise for striking a tone of respect and being in alignment with his predecessors' handling of state funerals. But that tone of respect will hardly negate what has been the president's overwhelmingly hostile posture towards the Bush family, the Obamas and the Clintons, both on the campaign trail and since taking office. (Alex Brandon/Pool via Getty Images) Former President George W. Bush and former first lady Laura Bush watch as the flag-draped casket of former President George H.W. Bush is carried to a State Funeral at the National Cathedral, Dec. 5, 2018 in Washington. While both the president and the first lady met privately with members of the Bush family Tuesday, as recently as last week, Trump shared an image with his millions of Twitter followers that called for Obama and Clinton to be jailed and investigated for "treason." Even so, the service itself did not carry some of the more political overtones present in the service for former Sen. John McCain earlier this year, which included a eulogy from McCain's daughter Meghan McCain, that seemed to take veiled shots at Trump himself. 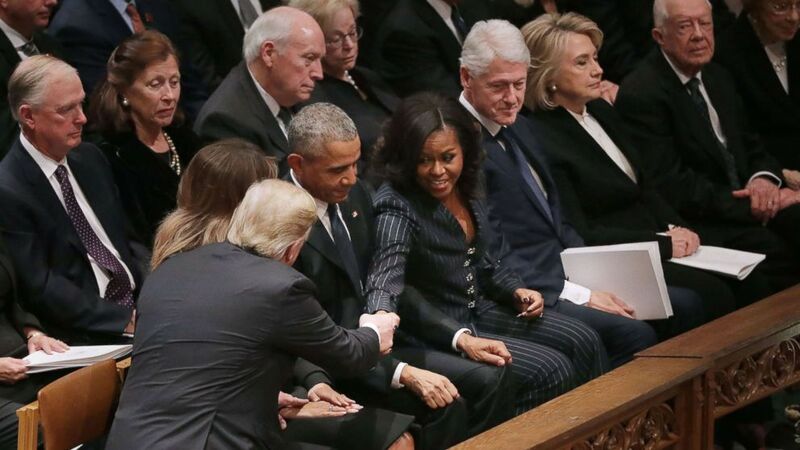 Trump was not asked to deliver a eulogy, marking a departure from the most recent state funerals for Ronald Reagan, Gerald Ford and Richard Nixon, where both George W. Bush and Bill Clinton delivered eulogies as acting presidents. As the church service ended, George W. Bush and the rest of the Bush family followed the casket out of the cathedral and watched as it was placed in the waiting hearse, which took the president's remains to Joint Base Andrews outside Washington for the flight to Texas. There, as a military band played the hymn, "Coming Home," the family once again placed their hands over their hearts as the casket was loaded on the plane and they then boarded themselves. He was being taken home to Houston, where his body will lie in repose at the St. Martin's Episcopal Church, where Bush and his wife Barbara first became members in 1959. There will be a funeral service at the church on Thursday before Bush's remains are transported by train to the George Bush Presidential Library and Museum at Texas A&M University, where he will be interred alongside his wife and daughter, Robin, who died at age three.